Hedges are frequently used in landscape gardens, they can help define a border, act as a wind break or screen out an unwanted view. 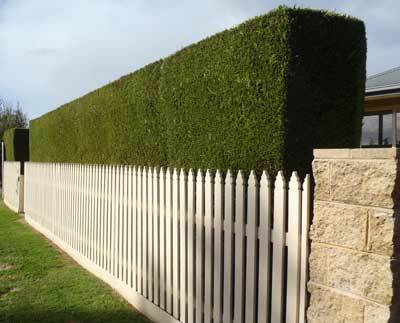 The size and style of hedges can vary considerably so there should be a hedge to fit your needs. Hedges naturally create an environment that means trees will be grown in close proximity, not all plants are able to adapt to this. Plants that are popular for hedges are well able to deal with this growing environment, and, given a bit of help, hedges can be kept looking great for years. How do I plant a hedge? It is best to start with plants that are all of a similar size, in pot size and plant height. The next factor to consider is how close to plant them. If you want and “instant hedge” then plant the trees quite close. In the long term though these trees won’t thrive and you may find individual trees will need to be replaced. For a better long term result the plants need to be given space to grow with less competition from the neighbourly plant. For a hedge which will grow to about 2m, spacing of between 800mm and 1.2m are usually a good rule of thumb. For smaller hedge plants these spacing need to be reduced. When planting a hedge it is important to ensure it is straight, using a string line or planting into a long trench can be a good way to achieve this. When should I trim the hedge? In Melbourne and Australia in general our mild climate means many gardeners only prune once a year after the summer season has finished. This can depend on the species used for the hedge, those with strong growth will need to be constantly maintained. A new hedge will also need more regular clipping to achieve the desired height and structure. How should I trim the hedge? Firstly, don’t wait till the hedge has reached its intended height to cut it back. This will encourage top heavy growth and unevenness. In the first few years of development, the hedge should be pruned back hard to encourage growth lower down, and over the following years, cut back a little less hard, so that when it reaches the desired height, the plant is well structured with thick growth to the base. Secondly, a hedge should always be wider at the base than the top. This allows for light to reach the lower parts of the tree and keeps the growth even. This is more important on south and east facing sides of the hedge. Which plants should I use for a hedge? The plant species you select must be able to withstand regular trimming and remain dense and evenly leaved, cope with the competition from neighbouring trees, be reasonably pest and disease resistant, and have an attractive form and colour.